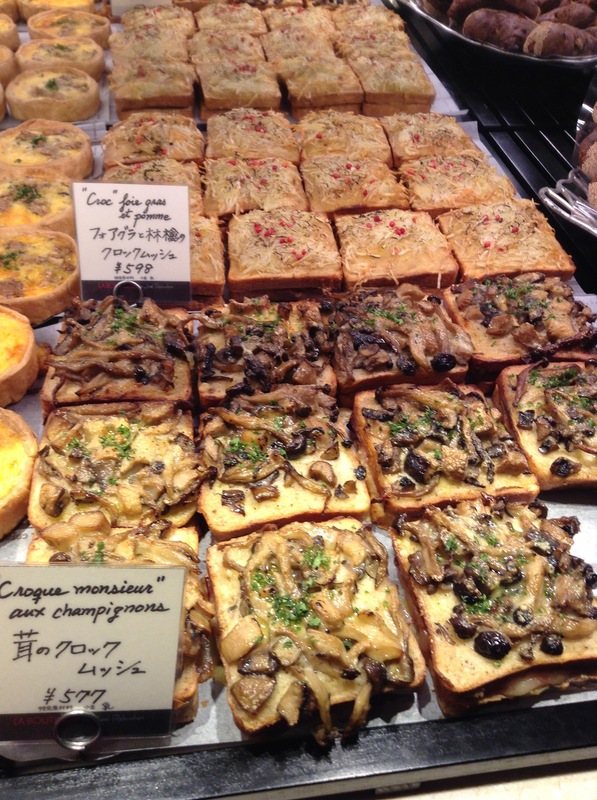 One of my favorite bakeries in Tokyo is from the famous chef Joel Robuchon, for savory breads made with excellent ingredients. 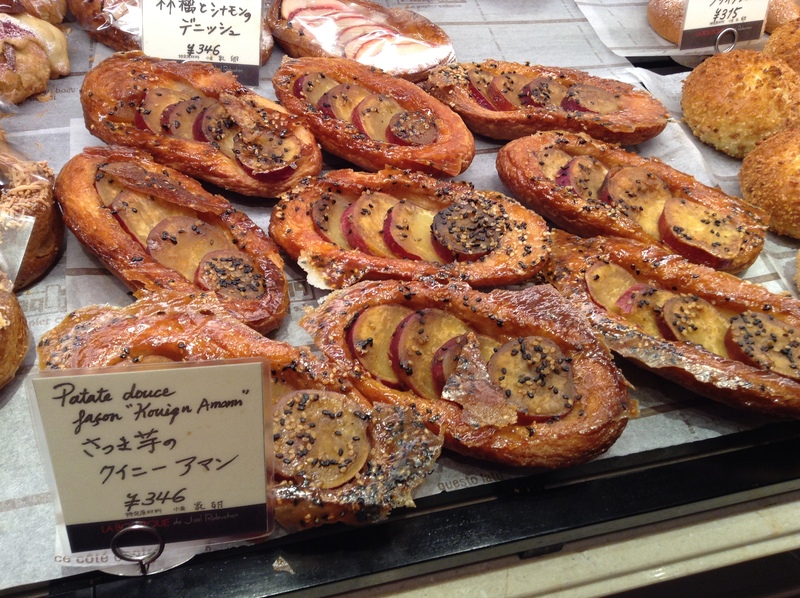 Le Pain de Joel Robuchon has recently opened near Shinjuku station in the NEWoMaN mall. Imagine one of France’s top chefs creating breads and sweets using French and Japanese ingredients? I love the l’Atelier de Joel Robuchon restaurant, but don’t often have the time to sit through a meal, so the boulangerie is a alternative to get my Robuchon fix. On the left above is a foie gras toast topped with apple and pink peppercorns croque monsieur, the right is my favorite, a cheesy potato bread with lardons. Crispy cheese bits contrasted with potato bites and meaty bacon. How many shops do you know serving foie gras croque monsieur? Seasonal breads like this bread with maitake, shimeji, and eringi mushrooms with walnuts change throughout the year. All of the above breads are best reheated in a toaster oven. The green olive fougasse never made it home, it was too hard to resist, and I highly recommend it. The Roppongi Hills shop has no seating area, but the Shinjuku shop does have a small café seating area by the bakery. There is also a retail shop in the Shibuya Hikarie B2 depachika. J’adore Joel Robuchon. For special occasions we love L’Atelier de Joel Robuchon in Roppongi. The food is exquisite, service is professional yet friendly, and it has a great wine list. But, at the moment we don’t have the luxury of dining out for long meals. So La Boutique de Joel Robuchon offers a taste of Robuchon, without the commitment of a time. A good friend first put this on my radar right after it opened. He was addicted to the tarte au citron and served it at all of his dinner parties. La Boutique de Joel Robuchon is both a patisserie and boulangerie. 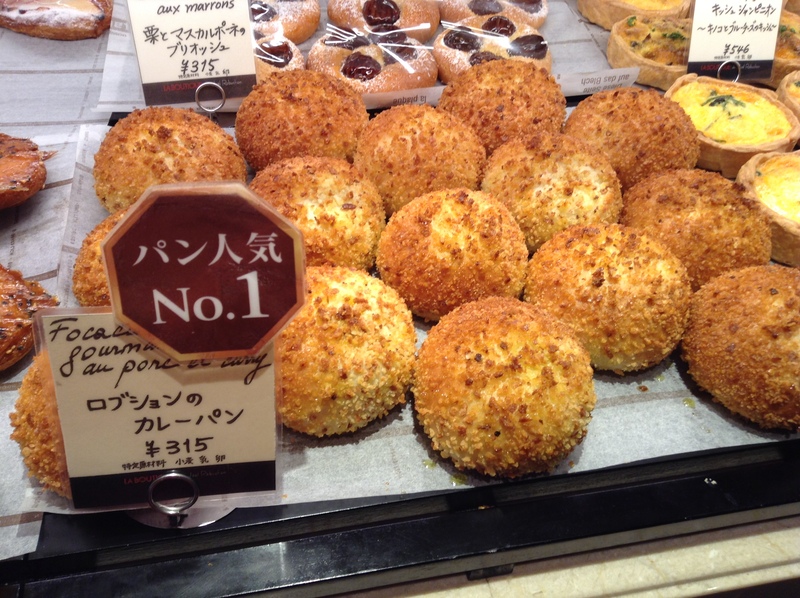 In the photo here the Roppongi shop shows off its most popular bread, a curry pan, stuffed with curry and crispy on the outside. 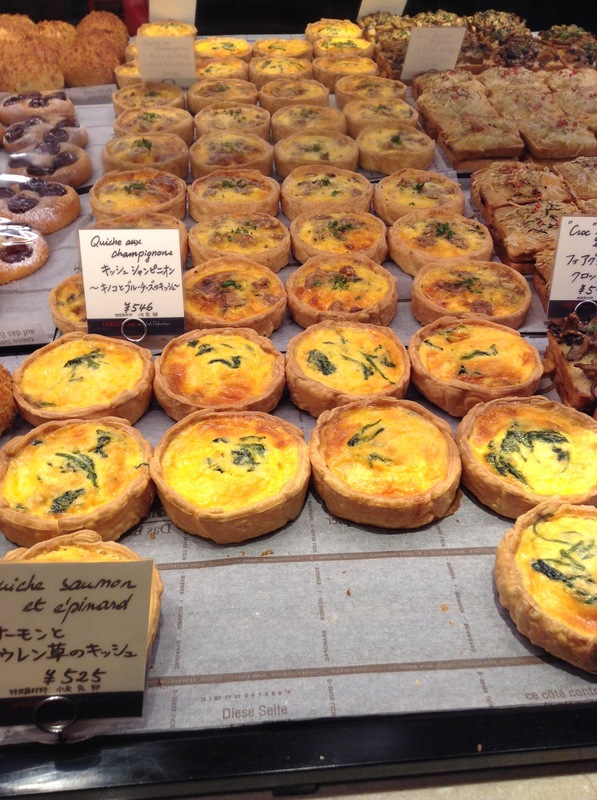 Monsieur Robuchon’s quiche with salmon and spinach or mushrooms. Notice how each one is made by hand. Kouign Aman is very popular in Tokyo and it is found at many bakeries throughout the metropolis. But this is the first time I have seen it with sweet potatoes that are in season at the moment. Actually, it looks like a nice fusion of kouign aman and daigaku imo, a traditional sweet made from sweet potatoes and sesame seeds. A nice nod to the local cuisine. And yes, you read correctly in the back sign, “Croc” foie gras et pomme, garnished with pink peppers. In front, croque monsieur aux champignons. We are so spoiled in Tokyo. There are three locations in Tokyo of La Boutique de Joel Robuchon. These photos were taken at the Roppongi Hills location. The other two are in Marunouchi Brick Square and Yebisu Garden Place. My only complaint is that the boulangerie doesn’t open up earlier. The shop I pass the most often, Marunouchi Brick Square, does not open until 11 a.m.